Hippocrates stated “All disease begins in the gut”, and this seems to be the case for autoimmune disorders. There are several studies on the effects of intestinal permeability (leaky gut) and autoimmune disorders, I recently came across this study and found it interesting: “Does the Gut Microbiota Trigger Hashimoto’s Thyroiditis”? Hashimoto’s is especially effected by gut health as about 20% of T4 is converted to T3 in the digestive tract by beneficial microbiota. 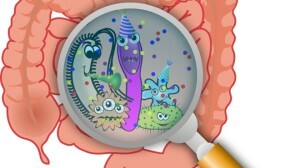 Aside from helping convert hormones, gut microbes also help create various vitamins, alleviate diarrhea and constipation, improve brain function, alleviate anxiety, lower cholesterol and blood pressure, and break down substances our body cannot use to either become food for the microorganisms or be turned into something our body can use. Healthy gut flora has also been found to be beneficial for those with Irritable Bowel Syndrome (IBS), Chron’s Disease, Eczema, Psoriasis, Depression, Autoimmune disorders and more. 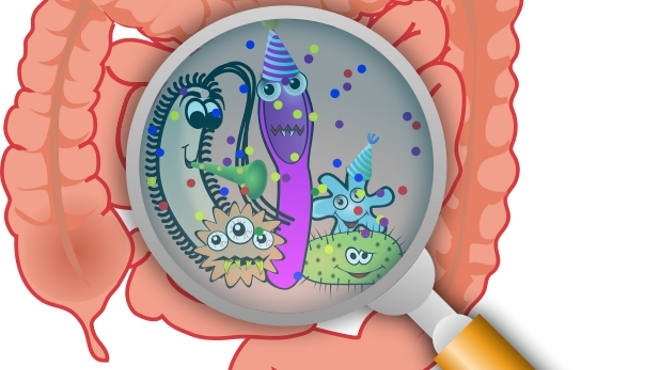 So, how do you know if you have too few healthy gut microbes? Which Microorganisms Do I Want? Saccharomyces Boulardii – this one is actually a beneficial yeast that helps to clean out candida! It also helps get rid of detrimental bacteria (including Helicobacter pylori) and…drum roll please… it can help not only with prevention but also with fixing intestinal permeability! Yeah! Lactobacillus species – these little guys have been found beneficial for diarrhea, gastroenteritis, enhancing the immune system, detoxing mercury from the body, and a ton more! Lactobacillus plantarum and Lactobacillus rhamnosus especially have been shown to help reverse intestinal permeability. Propionibacterium freudenreichii – again, most species of Propionibacterium are detrimental, but this particular one may alleviate the symptoms of IBS, prevent colon cancer, help in the conversion of glucose and help Bifidobacteria species utilize the oligosaccharaides discussed earlier in the prebiotics section. On top of eating foods chock full of healthy microorganisms, and other foods to help feed them, we can also go to our local health food store and buy a bottle of Probiotics. The list above gives you an idea of which microorganisms you want to see on the label. It is a good idea to rotate brands so you rotate species and really try to get a good mix of various beneficial microbes. Currently I am using a SBO Probiotic (Soil Based Organisms). That is where we used to get our beneficial gut flora, from dirt! Yep, before we all became clean freaks we used to play in the dirt and then eat our food without washing our hands! Imagine that! Those dirty hands contained beneficial microbes that traveled with our food down into our intestines and colon, where they setup home and started building colonies. Another favorite of mine is Enteric Coated probiotic capsules. Enteric coated means that the capsule has a special coating on it that resists stomach acid just long enough that the capsule can make it into the small intestine before it releases all the lovely microorganisms contained inside. This gives those little guys a much better chance at surviving digestion and setting up shop where they should be in our digestive system. The most common method a manufacturer will use to explain how potent their product is will be stating how many CFU’s are in a capsule or a dose. CFU simply stands for “Colony Forming Unit”. Microorganisms create entire colonies of themselves. This is a good thing! A Colony Forming Unit listed on the label gives you an idea how potent the product is, and the higher the number the better. Remember, they need to survive the stomach acid environment before reaching their destination. Some will be killed off in the stomach, others will be weakened to a point that it may take them a while to recover. So the higher the number going in, the higher the number of healthy microorganisms reaching the destination point and creating their colonies. Oh – and some probiotics come in powder form that you mix with water or juice to take. If you have a hard time with swallowing pills or capsules, then you might try this method. It’s also great for kids! Plus, you can find flavored varieties as well (just double check what they used for flavoring). ← Happy Thanksgiving the AIP Paleo Way!